If you or someone you know needs assistance with dealing with the recent tragic events in Baton Rouge please call the Office of Behavioral Health Crisis Hotline at 866-310-7977. Staff are available 24/7. 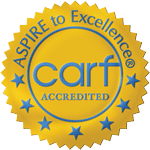 Click here for CARF accredited services.